JA-Pens has a Canine Good Citizen Evaulator on staff! We know how to groom winners. JA-Pens Grooming Salon staff are pet CPR certified ! Did you know that JA-Pens Grooming Salon offers a brush-out service? Large or small, we groom them all! Your pet could be featured on our website photo gallery. Ask one of our staff about our pet photo program. JA-Pens Grooming Salon Now Offers Spa Treatments. JA-Pens Grooming Salon offers customized T-shirts, Tote Bags, and more! We care about your pets. See what other pet owners have to say about our grooming services. Read our reviews on yelp.com. On the Lookout for Good Behavior! JA-Pens has a Canine Good Citizen Evaulator on staff! 2017 Christmas Parade: Winter Wonderland! JA-Pens Grooming Salon participated in the 2017 Christmas Parade in Williamsburg, Virginia. See the pictures from this event! 2016 Christmas Parade: The Night Before Christmas! JA-Pens Grooming Salon participated in the 2016 Christmas Parade in Williamsburg, Virginia. JA-Pens Grooming Salon particpated in the Bernese Mountain Dog Club of America 2016 National Specialty in Frankenmuth, Michigan May 1, 2016 - May 7, 2016. See our awards for the 2016 Bernese Mountain Dog Club of America National Specialty Dog Show. On Saturday, March 19, 2016, Chevy, Destiny, and Myles went looking for Leprachauns in the 2016 St. Patrick's Day Parade sponsored by the Bernese Mountain Dog Club of Hampton Roads. As of January 5, 2016, Destiny is a Certified Canine Good Citizen. From the AKC website's "What Is Canine Good Citizen?" page: "Started in 1989, the CGC Program is designed to reward dogs who have good manners at home and in the community." 2015 Christmas Parade: A Jolly Time! JA-Pens Grooming Salon participated in the 2015 Christmas Parade in Williamsburg, Virginia. 2015 K9 Karnival: Dog-gone, that was Fun! The 2015 K9 Karnival was held in Virginia Beach, Virginia, on May 16, 2015. The whole JA-Pens staff were there for the exciting events. 2015 ecoFest: Fun was Reused and Recycled! The 2015 ecoFest was held in Norfolk, Virginia, on May 2, 2015. 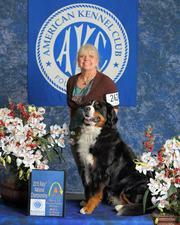 Chevy and Teresa were there with the Bernese Mountain Dog Club of Hampton Roads. 2015 AKC National Rally Championship in the "Show Me" State! Chevy and Teresa were honored to participate in the 2015 AKC National Rally Championship in Grey Summit, Missouri. 2014 Christmas Parade: Deck the Paws! JA-Pens Grooming Salon participated in the 2014 Christmas Parade in Williamsburg, Virginia. 2014 HOWL-O-WEEN Walk: A Scary Good Time! The HOWL-O-WEEN Walk was held in Williamsburg, Virginia, on October 19, 2014. Check out the pictures from this Halloween-themed event. 2014 K9 Karnival: Dog-gone, that was Fun! The 2014 K9 Karnival was held in Virginia Beach, Virginia, on May 17, 2014. The whole JA-Pens staff were there for the exciting events. The 2014 Lafayette RIVERFest was held in Norfolk, Virginia, on April 26, 2014. Chevy and Teresa were there with the Bernese Mountain Dog Club of Hampton Roads. 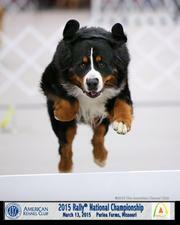 The 2014 Bernese Mountain Dog Club of America National Specialty Show was held in Hampton, Virginia, on April 6 - 12, 2014. Chevy and Teresa were there, and it was exciting to see so many of Chevy's distant cousins in one place! Chevy and Teresa participated in the Williamsburg Christmas Parade on Saturday, December 7, 2013, with the Bernese Mountain Dog Club of Hampton Roads. View photos from the parade. JA-Pen's Grooming Salon was featured in the November, 2012, edition of Pet Tails Magazine. Read the article in PDF form. Read our Google Places reviews. Preparing for the Potomac Valley Bernese Mountain Dog Specialty Show 2012 handling competition, we relied on the Canine Obedience Training Program at Hunt Club. Call Dory Hofmann at 757-532-7688 to arrange a training session today, and tell her "Chevy and Teresa sent you!" Call us today to schedule an appointment or to ask questions about our services. Copyright © 2009–2019 JA-Pens Grooming Salon, LLC. All Rights Reserved.